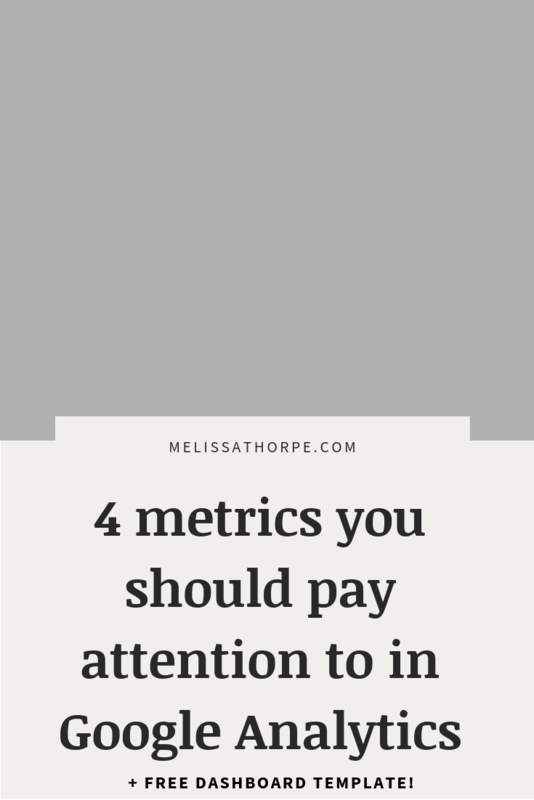 4 Important Metrics in Google Analytics + free dashboard! Google Analytics can be very overwhelming for business owners. And I get it. Data and numbers overwhelm many people. It probably feels like high school math all over again, right? Well, you’re in luck! I was actually a math nerd in high school (AP Calculus anyone?) and I love analyzing data in Google Analytics. I’m a firm believer in the fact that data never lies so developing strategies based on numbers is one of the best things you can do in your business. But before the analyzing and strategy development can happen, you should know the basics. The following are 4 important metrics in Google Analytics you should be focused on. These are in no particular order; I think they are all important and I explain why below. Importance: Shows which content is being viewed and enjoyed by your viewers. Interpreting the data: If you’ve ever looked at your analytics before, this is probably one of the easiest to understand metrics. At a quick glance, you can see exactly which pages are receiving the most traffic. But then what? Make sure those top pages are updated with current information and be sure there’s a relevant opt-in to capture the visitor’s email address. If you blog, take a look at the top posts. What category are they in? Do they all have a similar theme? (ie. How to posts? Case studies? Behind-the-scenes?) The answers can tell you where your focus should be with new content in the future. Dive Deeper: At the top of the report (above the graph), you’ll see two tabs “Explorer” and “Navigation Summary”. Click on “Navigation Summary”. Now, under the graph, you should see “Current Selection: /”. The forward slash represents your homepage (you can change this to other pages as well). You can change the number of rows, for the tables below, to the right too. The data under these two tables can tell you if your strategy is working. For example, under the Next Page Path table, you’ll see all the pages that are being viewed after the homepage. Do these pages line up with the strategy you set for your website? Do you want visitors viewing your service details, but the data shows they head straight to the contact page instead? Then you’ll want to think about how your content is presented to your visitors. You’ll also want to look at the data above those two tables. Entrances, Exits, Previous Pages, and Next Pages. Those percentages represent how many visitors entered your website via the homepage, exited your website via the homepage, entered your website via a previous page, and went on to visit another page after viewing your homepage. For example, in the image above, you can see 88% of visitors are entering the website via the homepage and 56.5% are exiting via the homepage. Strategy-wise, you want those visitors to stay on your website longer, so I’d recommend taking a look at your homepage and how the content is laid out to your visitors. Interpreting the data: The numbers can depend on your target audience, but, in most cases, returning visitors are better than new visitors. When you’re building an audience, you want returning visitors; they are telling you the content you’re producing is what your audience is looking for. New visitors are your potential new leads and as this number increases, your returning visitors number should increase too as those new visitors return. If you’re seeing a higher percentage of new visitors, think about how are you keeping in touch with your visitors? What are you doing to get them to come back? If you’re thinking “uhh, I don’t?” then you need to start! This is a very important step to having returning visitors. I’d start with email marketing; put your new content in front of those you know are already interested! And be sure you have plenty of opportunities for visitors to subscribe. Dive Deeper: Data itself can tell you a lot. If you look at the source/medium of where your visitors are coming from, you can see which area you need to focus your time. For example, if the majority of your new visitors are finding your content via search engines then you know you need to focus on adding more sign up opportunities on your website to get them on your email list. Importance: Shows where your visitors are coming from and can help you understand if your marketing efforts are paying off. Interpreting the data: Say you’ve spent the last 6 months focusing on Pinterest. You’ve created (or hired someone to create) new graphics for all your posts, spent an hour or more each day pinning and repinning your content and you’ve made sure to share other relevant content too. How do you know that time has paid off? If “pinterest.com / referral” is at the top of this list, you’re probably doing pretty well, but if not, you may need to rethink your strategy. The best way to know is to compare the data to the last 6 months (you can do this under the date selection in the top left corner). If your top source/medium is “google / organic” then you know your SEO efforts have been paying off. Or maybe you didn’t even try with SEO and it’s come organically. Even better! Interpreting the data: You will be able to see referrals within the Source/Medium data report, but I like to focus on referrals so I know exactly where links to my website are on online. For example, if someone did a round-up post about the top 10 recommend tech gurus and I was on there, I’d want to know! That way I can go comment, thank them, and get to know the person recommending me. Just like word of mouth referrals, website link referrals are a great opportunity for your website and content. Having those links to your website can help with SEO too! Dive Deeper: As I mentioned, I like to know exactly where links to my website are located. And to do that, I can select “Referral path” under the Secondary dimension dropdown just above the report table. This will show you the exact page your website is linked from. An easy way to view all your data at a glance in Google Analytics is via Dashboards. You can quickly create widgets that showcase the data all in one spot. I’ve created a dashboard for you (below) with all of these data points and I’m sharing it with you for free! Just sign up below. Once you click the link for the freebie template, you’ll choose which analytic account and view you want to add it to. 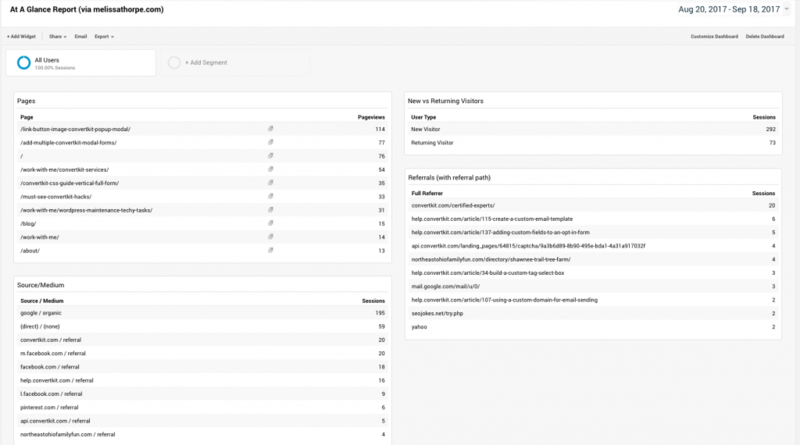 Then you can access the Dashboard under Customization –> Dashboards. What questions are you dying to have answered about Google analytics? Let me know in the comments!